The Smurfiest Smurf to ever Smurf the Smurf! Awarded for earning all other trophies. Use your Special Power 15 times in one level. When Azrael is pawing inside the cabinet for Smurfs, give him one of Jokey's presents instead. Finish a level with another player. Free The Cursed Frog without getting hit. Use one crown to free at least 10 Animal Friends. Defeat Azreal without getting hit. Defeat Hackus and Vexi without getting hit. Free The Polar Bear without getting hit. Free the Phoenix without getting hit. Defeat Gargamel without getting hit. Stay in one True Blue for 30 seconds. It Takes a Lot of Guts! Use Gutsy Smurf's skill 20 times in one level. Use Grouchy Smurf's skill 20 times in one level. Use Clumsy Smurf's skill 20 times in one level. Use Papa Smurf's skill 20 times in one level. Use Brainy Smurf's skill 20 times in one level. Use Jokey Smurf's skill 20 times in one level. 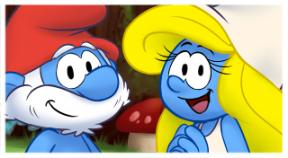 You smurfed with the wrong girl! Use Smurfette's skill 20 times in one level. Use Hefty Smurf's skill 20 times in one level. Use Vanity Smurf's skill 20 times in one level. Play a level and free no Animal Friends.